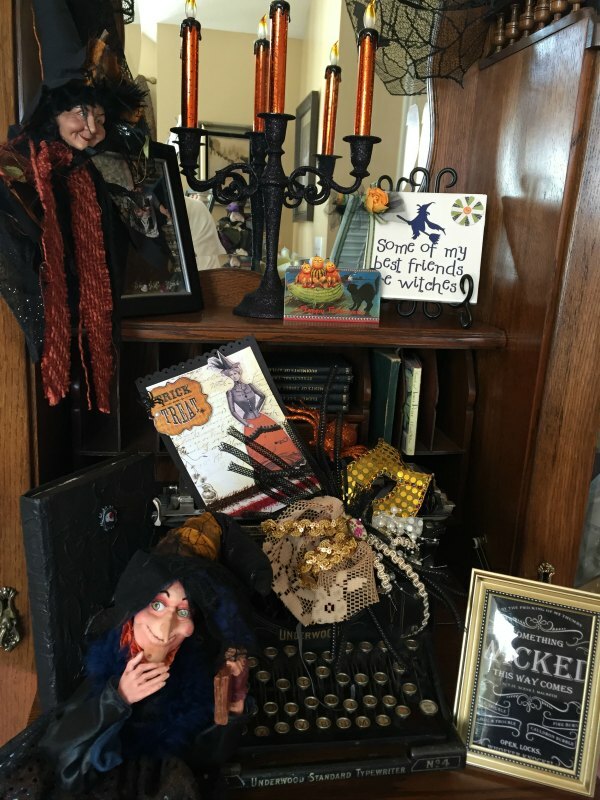 It’s that time of year again when my witchy friends come for a visit. 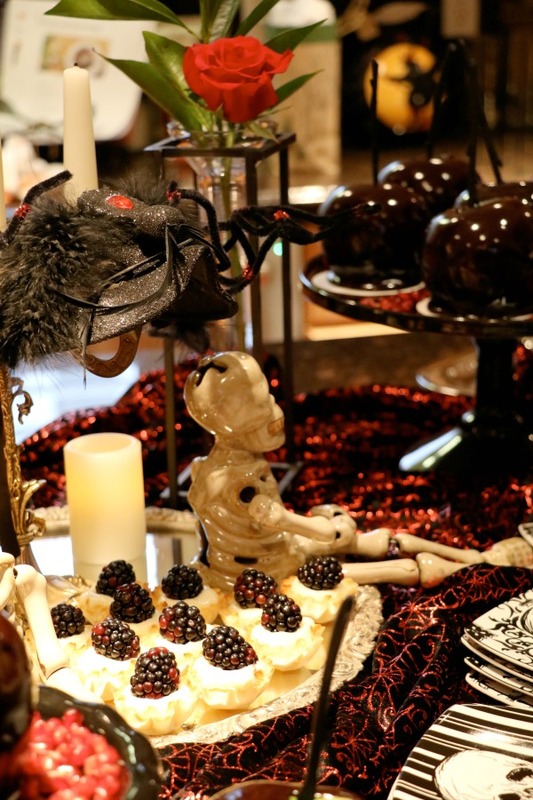 If you follow my blog you already know when I host a tea party I start with a theme and run with it. 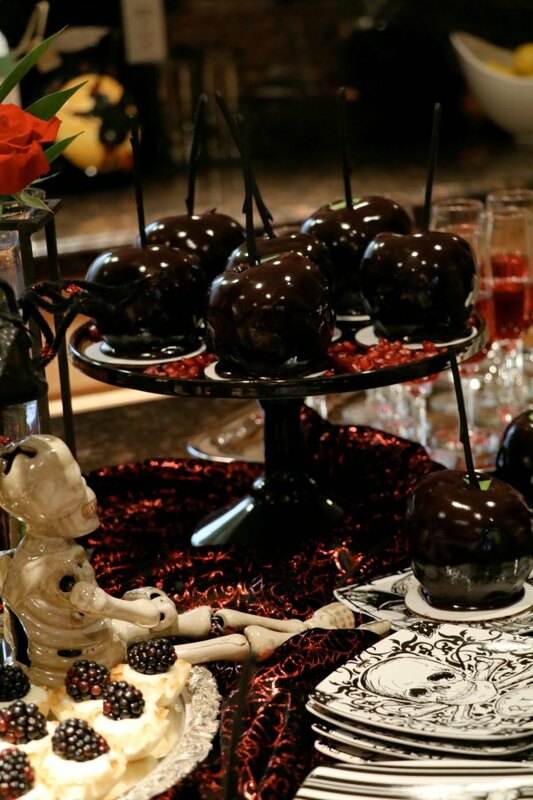 This year for my annual witches tea party I decided on the theme “Poison Apple” from snow white. 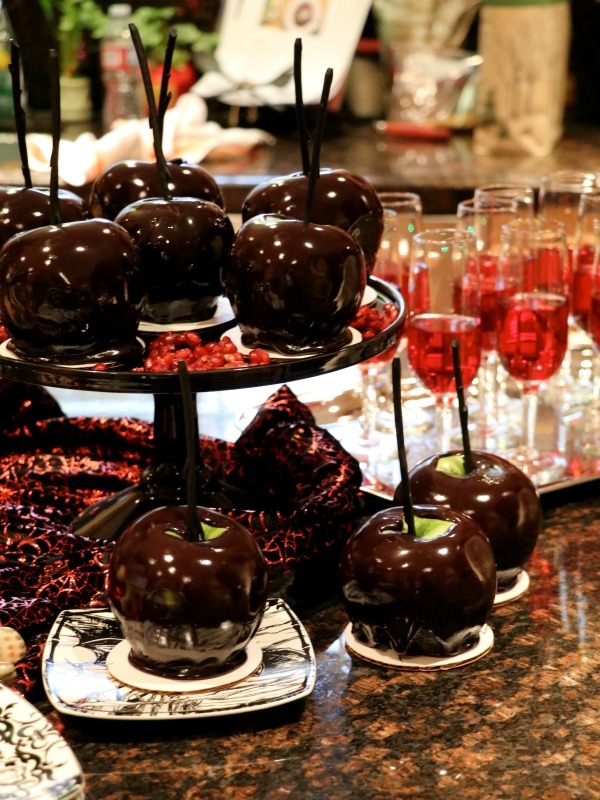 Those gorgeous black apples just caught my attention this year . . .
see what I mean . . . and the best part, my dear friend Lisa volunteered to make these for the party!!! That does deserve a cheer! I’m learning how to quickly say, “yes” when my lovely friends offer to help, it truly adds to the occasion. With the ‘Poison Apple’ in mind I went to work creating the setting. 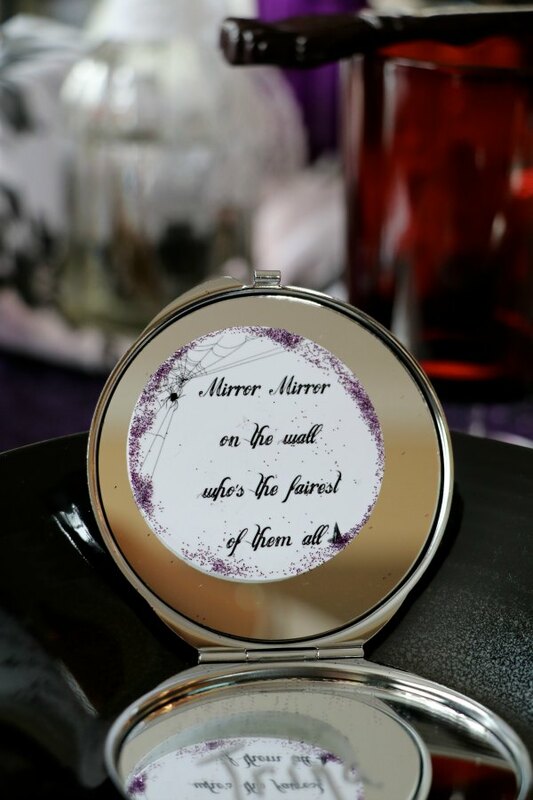 I knew the ‘Mirror Mirror on the Wall’ must be included so I decided compact mirrors would make for a perfect place card and party favor. I designed the little tag, glittered the edges and taped it on to one side, the other side I wrote their names with an marker that can be wiped off. 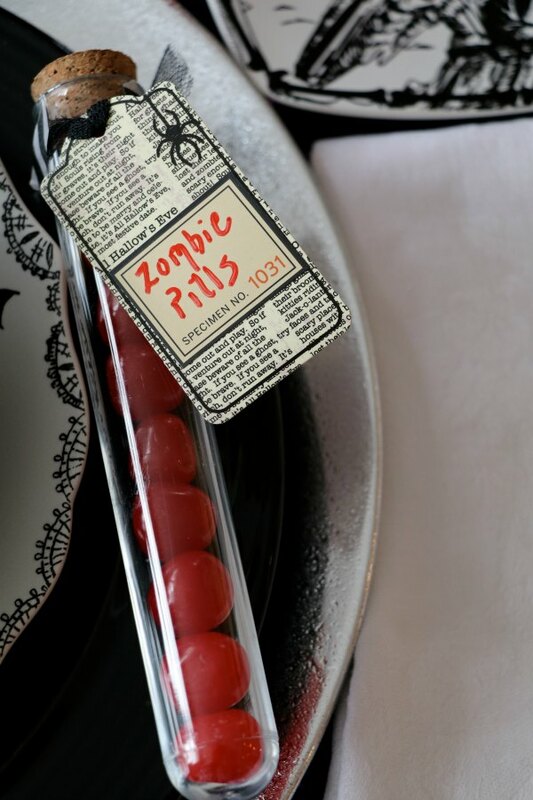 Each place setting also had a test tube filled with red sour drops, which added just the bit of red touch I was looking for. With this theme in mind I wanted to stick with purples, blacks and just a hint of red. 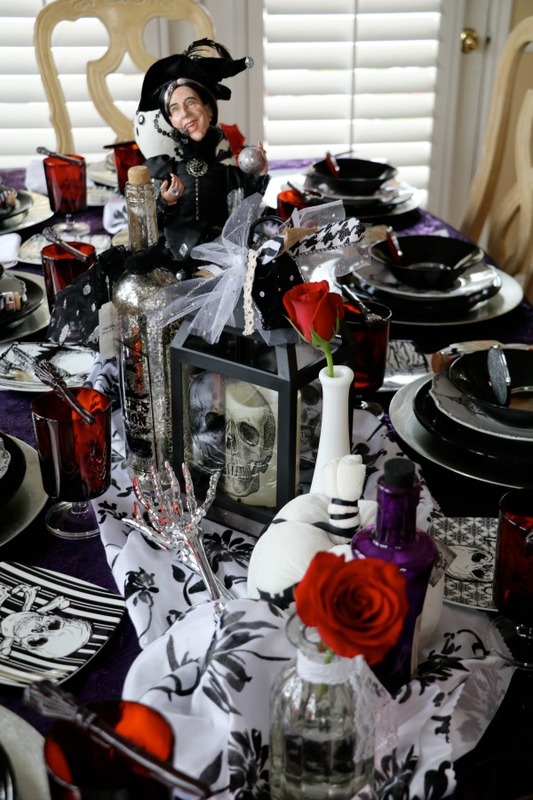 I started the table setting with a purple table cloth and overlaid it with a piece of purple Halloween lacy material. For the table runner I simply bought a few yards of white decorative fabric that I knew would tie it all together. 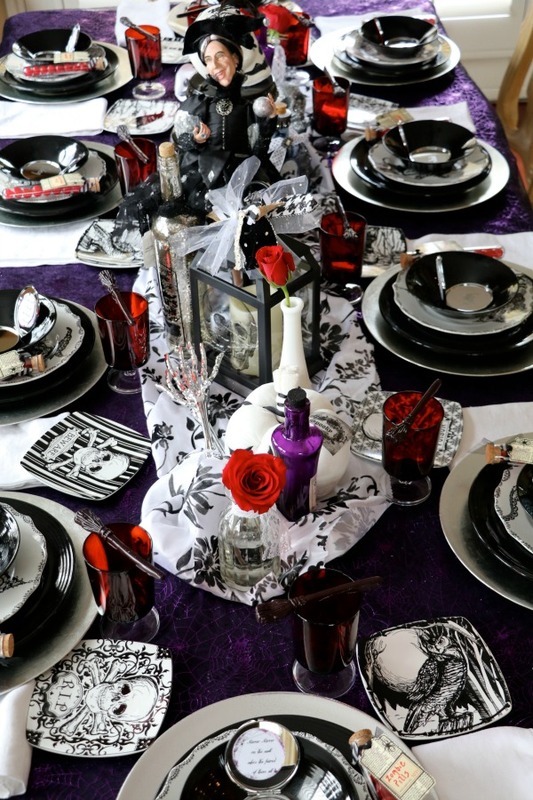 Then I began places objects of different height down the center to create my tablescape. 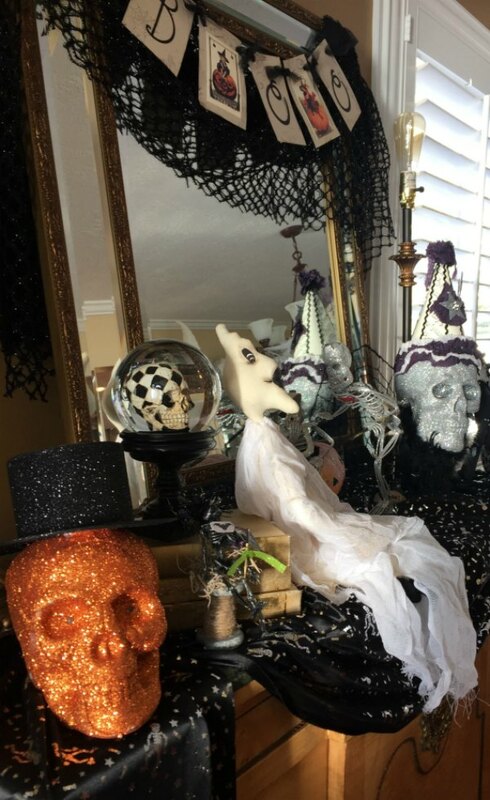 I just grabbed from my Halloween stash those that were white, black, purple and some silver. Then I purchased fresh red roses to add the pop of red I wanted. 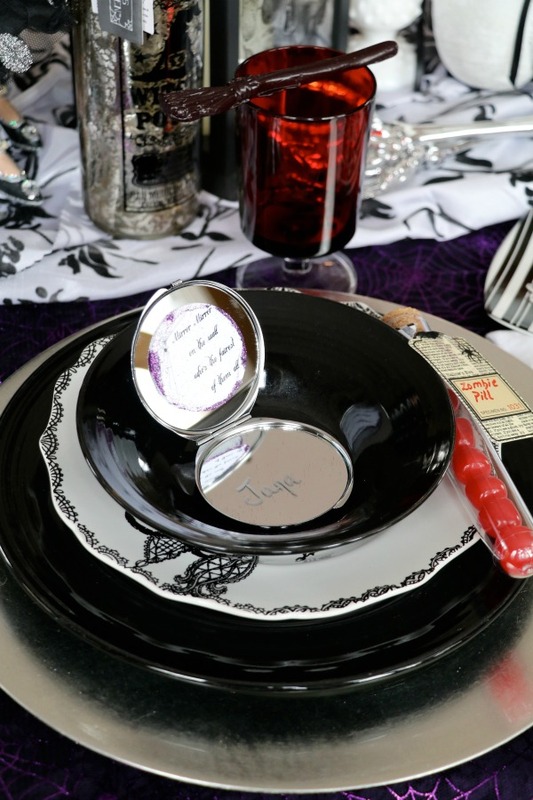 For each place setting I began with a silver charger plate, followed by a black dinner plate, halloween salad plates and black soup bowls. 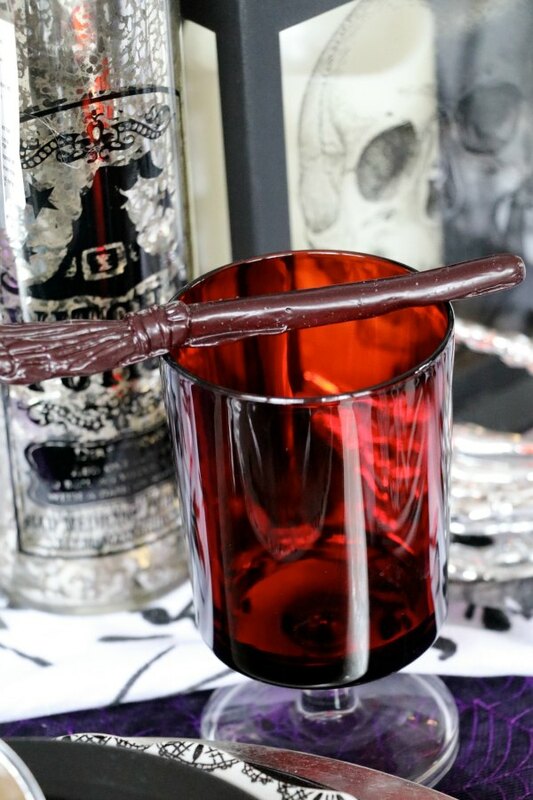 I decided to use my red vintage goblets and added these adorable candy witch broom sticks for stirring. for the delicious drink I spiraled apples and placed them inside each goblet and then added 1/3 sparkling water, trader joes apple cider, and ginger ale. Here’s the table setting ready for guests to arrive. And here it is when we are actually eating. I’ve learned over the years its a great idea to have an appetizer station so when your guest arrive they have a place to mingle while you may be finshing the last minute prep work. This night we had . . .
Pumpkin cranberry crackers (trader joes) with a dollop of ricotta cheese and honey vanilla greek yogurt (mixed together) then topped with pumpkin butter and sprinkled with graham crackers. Then we all toasted to who’s the fairest of them all (and it’s just cranberry juice since we are all non alcohol drinkers). For dinner I served a fall salad with a maple vinegrette dressing, sweet potato raviolo’s, and two different soups. Hearty chicken pumpkin soup and Rachel Ray’s lentil beet soup. 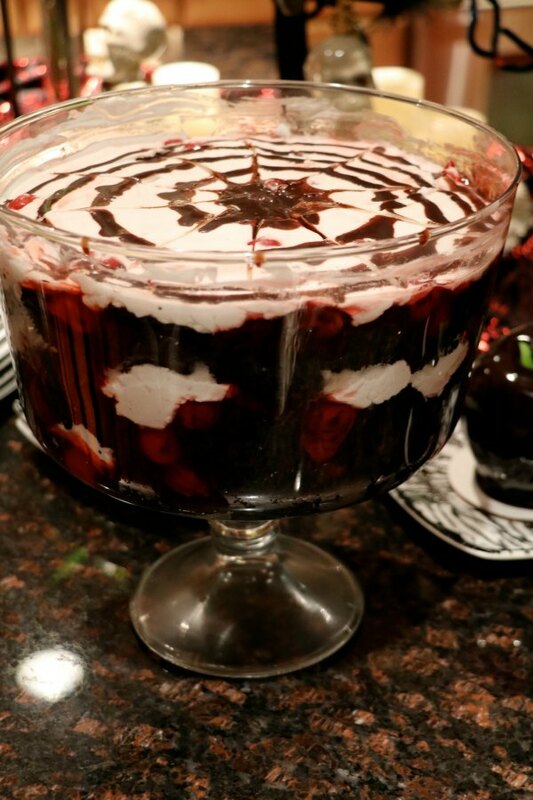 And for dessert, my other dear friend Patty volunteer to bring a cherry black cake truffle . . . YUMMY and beautiful. You will also find most of my home set for this holiday . 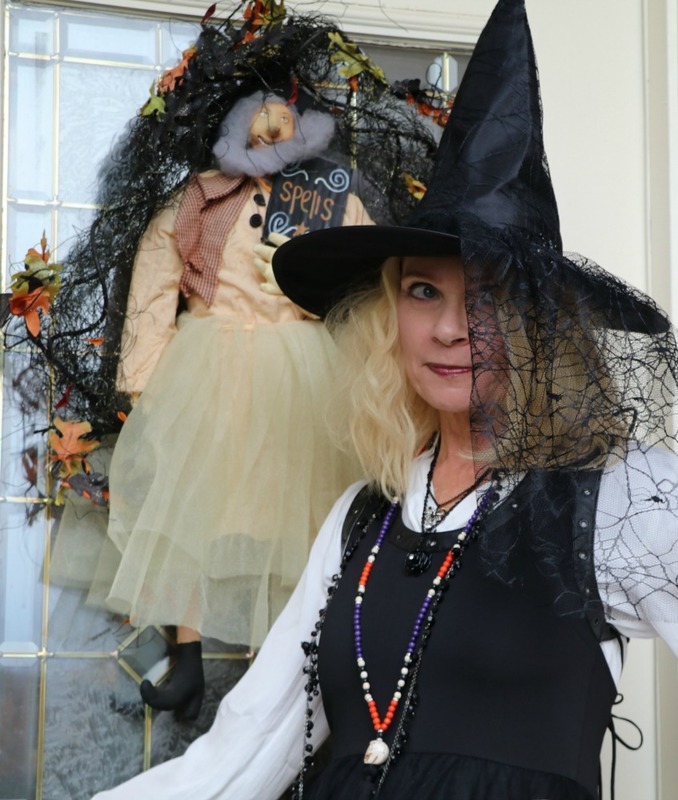 . .
As well as witchy Trina ready to greet her guest. As I’ve said before, there is nothing better than spending time with dear friends. It truly brings you closer together even when you’re witches, which by the way, just adds to the many hours of pure laughter. Thanks for dropping my friends, I’m off now to begin prepping for the next group of witches arriving tomorrow, hehe. Gosh, every time your parties seem to get better. Everything looked perfect. 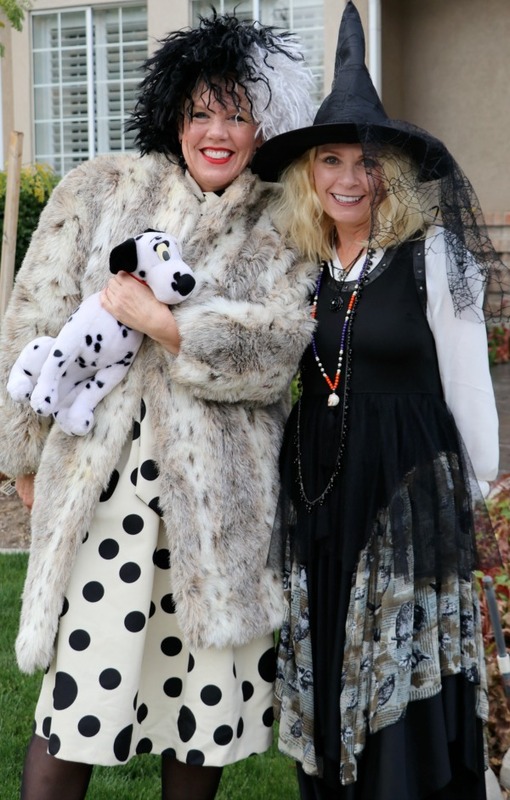 I adore your friend’s costume, Cruella. 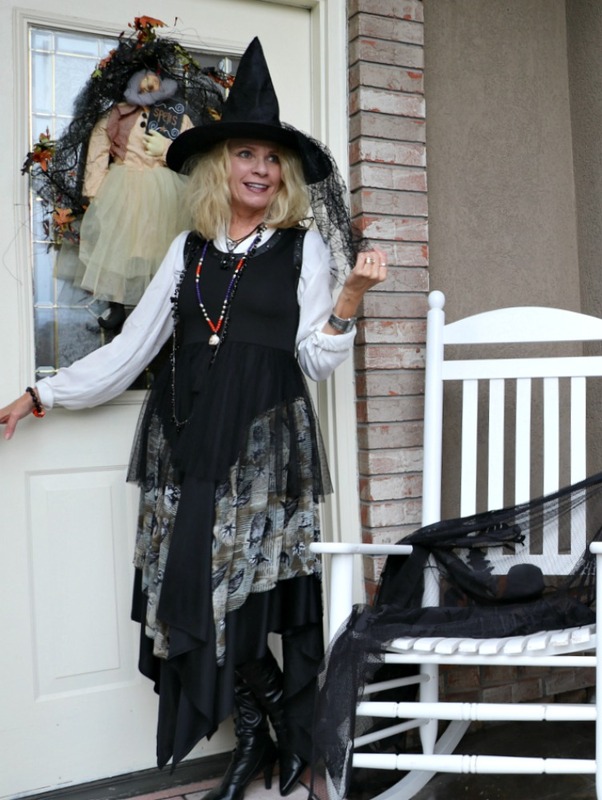 She found the entire costume thrifting, you would love this woman! OK, next year you’re coming for sure! Thank you! It’s alwasy such a fun party. Wow Trina, everything is fabulous. What a clever theme! A d your table was over the top!! Ever so fantastic. All your parties are. This one is again grand. Love how you explain the tablescape (did you mean shape? Or is scape a word? Anyway I knew what you meant. 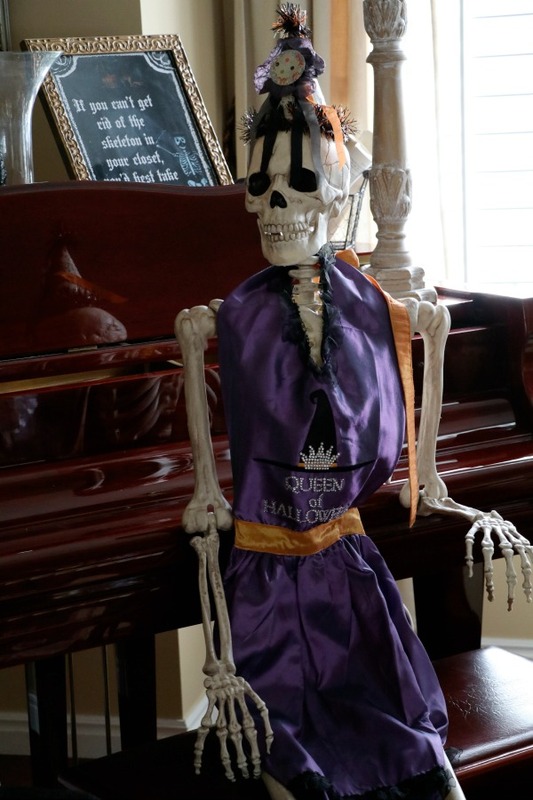 Had to laugh over “I just grabbed from my Halloween stash”. 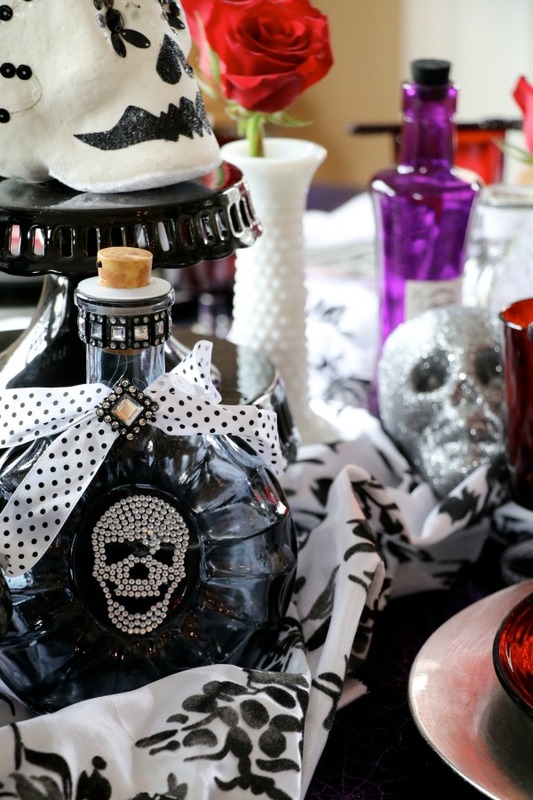 Sure.. who doesn’t have a Halloween stash? Haha. Love Lisa’s take on the witch Cruella. Your compact mirrors and test tubes are very good ideas. 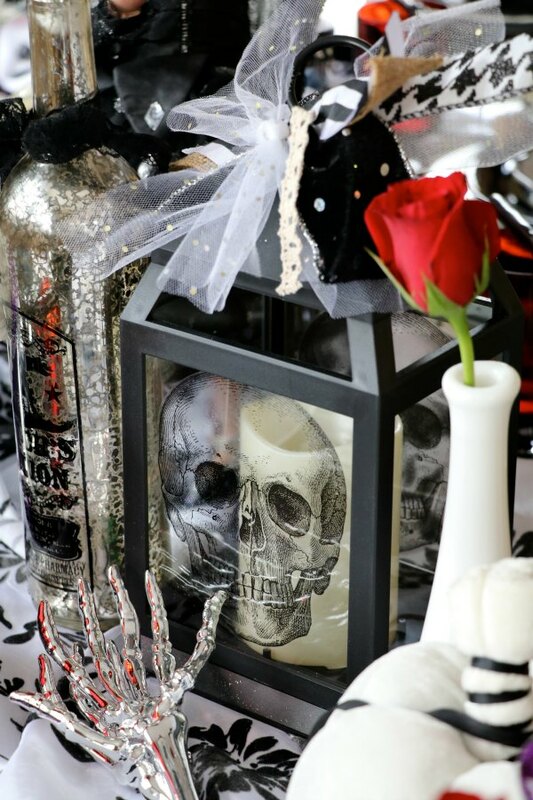 I can imagine that such a theme enhances the fun and laughter with friends. Which is of course the best. 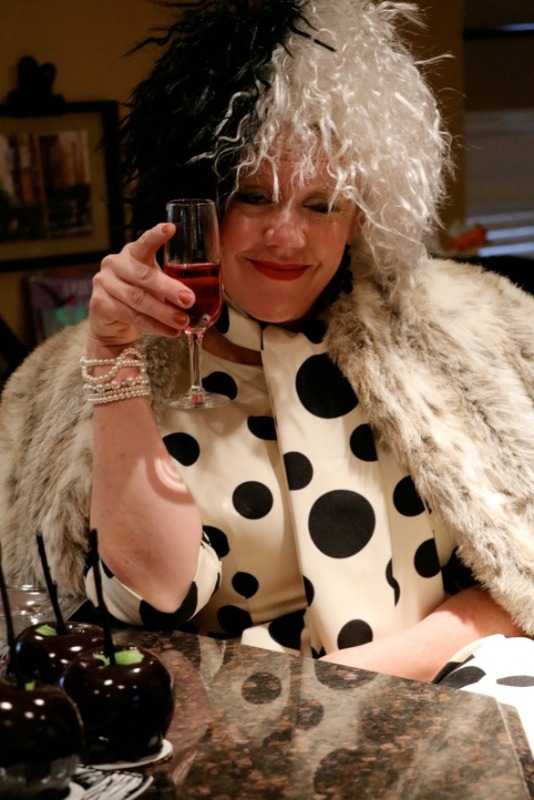 Isn’t that Cruella costume the best? She found the entire outfit at a local thrift store and the dress is actually so cute. I don’t know what it is about this party bu I’ll tell you, we usually laugh so hard its crazy, It must be the witches in us. So, so fun! What a wonderful event and just beautifully decorated. 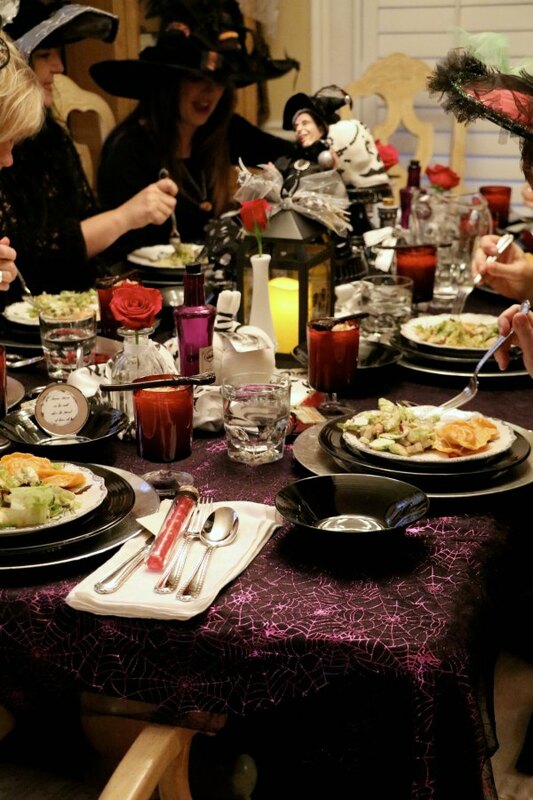 The food look delish and I love the costumes. Never have I seen a witch as beautiful. I love how you went all out for with this theme. The menu, the deep dark apples, the compote with a siperweb top, You are so talented. You should have a tv chanel, on the home and garden network.